Mainland Machinery / Equipment / The Sheet Metal Stamping Process: How Does it Work? How Does the Sheet Metal Stamping Process Work? 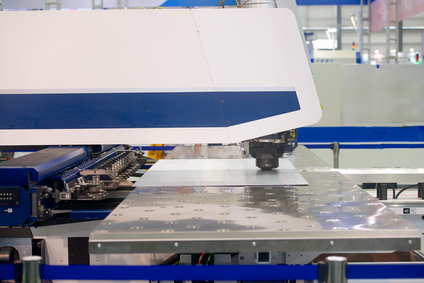 Sheet metal is one of the strongest materials that can still be easily shaped and cut. Plus, sheet metal is recyclable, which drives costs down. Metal stamping is used to produce parts in many industries. Original Equipment Manufacturers (OEM) most often make use of sheet metal stamping to make their parts where casting would be too expensive. It’s inexpensive and efficient, but it’s likely you don’t really know how it works. Some OEMs produce their own stamped sheet metal on site, while others outsource to Tier 1 suppliers. It is these suppliers that build the dies for stamping down the line. Sheet metal itself is usually made of steel, but stamping can be done with all kinds of metals, including golds and advanced super-alloys. Basically, sheet metal stamping involves a flat metal sheet, also known as a blank, being pressed between a die and a punch to get the desired shape. These parts form the press, the ultimate tool of stamping sheet metal. Of these, the die is probably the most complicated, and are often designed with inserts to produce variations on standard presses. You’ve probably seen dies used to make novelty souvenir coins — dies can be used for all kinds of processes and materials. They can be small enough to build microelectronics or large enough to cut out sides of busses. Presses can be built as single stage or progressive blanking tools. Progressive Blanking Press Tools – stamping is done by the machine prior to blanking, so the complete component is punched out throughout the blanking die. As blanks are punched out of the sheet metal, the come through the die, which is built with a slight angle so that blanks don’t get stuck inside the die. Accidental hold ups can damage the machine, so it’s important that the stamping and blanking process continues smoothly. Sheet metal presses are powerful machines. It takes about 71 tonnes of pressure to cut a 10 inch circle out of .125 inch sheet metal. Modern presses range from 10 to 50,000 tonnes of force. Maintenance Technician – repairs and maintains stamping dies, correcting any problems. It’s good to know that metal stamping really is effective and inexpensive. I think it’s amazing that we’ve developed the technology to create a process like metal stamping that can easily create many different metal products. I also think it helps to understand the process and so that you can choose a service that is most cost effective and high quality for your metal product needs.